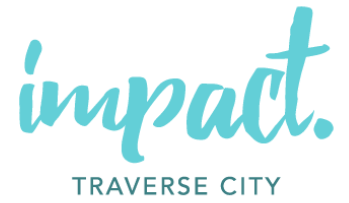 Inland Seas Education Association was very excited to receive the Impact 100 TC grant in 2017. 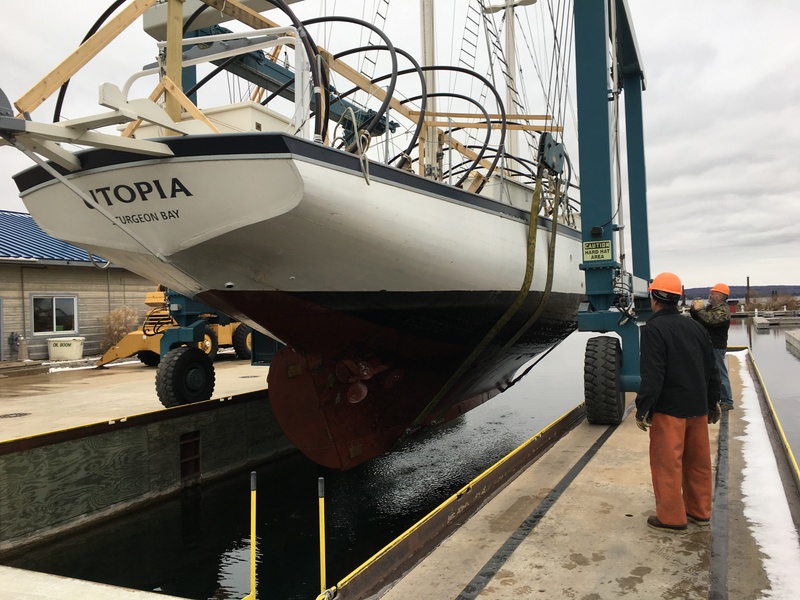 We began work on the schooner Utopia immediately in anticipation of having her ready for final Coast Guard inspection in Fall 2018. But like any renovation of a seventy-year-old asset, it did not run as smoothly as expected. It is rare that a project of this kind of undertaking can be pulled off without some hiccups. Inland Seas has spent most of the winter dealing with a variety of hiccups, causing the first phase of the Utopia retrofit to take much longer than anticipated. Our winter was spent doing demolition work to gain access to the underwater portion of the hull needing repair. These pictures show the results of some of that demolition. Unfortunately, the further we dug the more areas we identified for repair. This expanded work, combined with an untimely knee replacement surgery and a broken ankle on the two welders originally dedicated to this project, have exasperated the delay. We have hired a new welder to begin the steel repairs, but because we are so far behind schedule Utopia has to be moved to a different location in the marina lot so she doesn’t interfere with the launching of other boats. This must be done before further work can be completed. The latest round of snow has delayed that move. With all of that said, we expect to shift our attention from demolition to repair within the next couple of weeks. Our welder is ready, the shipwrights performing the wood repairs are ready, and the weather is improving. 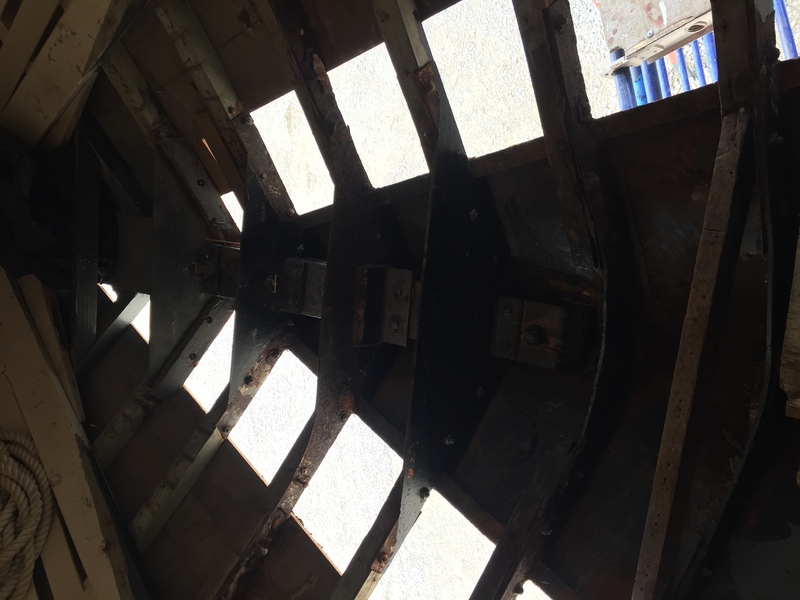 While we are a little behind schedule we are still confident that the needed repairs will be completed and the boat put back in the water in August. 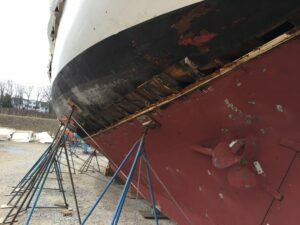 This unfortunately affects any summer programming we had hoped to schedule on the ship, but if all goes well, she will be ready to welcome students aboard in the fall for dockside programs. We will continue the steps to seek a Coast Guard license to carry passengers for Utopia as soon as all repairs are made. The difficulties we have encountered with this major project would have been insurmountable without the funding we received through the Impact 100 TC grant. This grant, the assistance of our dedicated volunteers, and the tolerance of Irish Boat Shop through it all have continued to push us through every hiccup we’ve come upon.